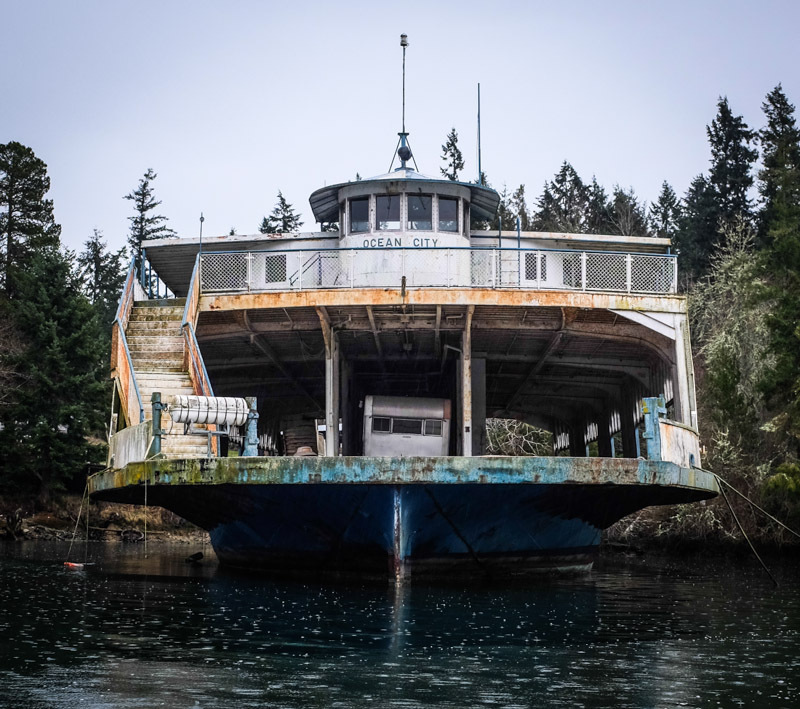 Here in Oro Bay on Anderson Island in the South Puget Sound sits the Ocean City, a 189-foot 50-car ferry built in 1928. Originally steam-powered, it was built for the Reading Railroad. 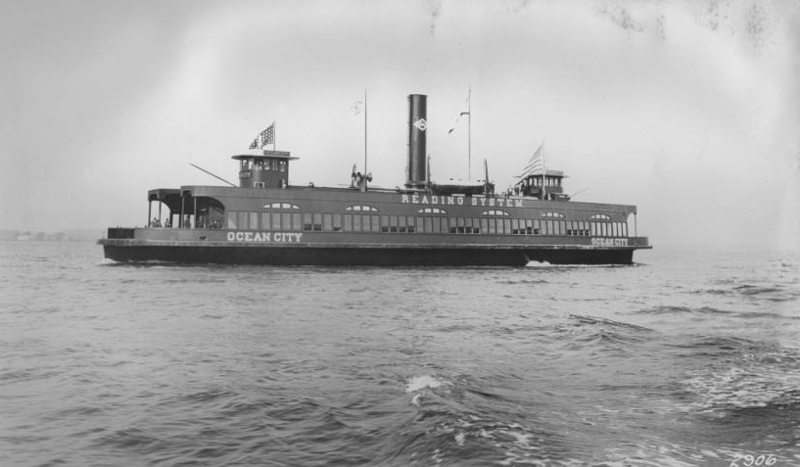 Re-powered with a 1600hp Fairbanks-Morse engine, the ferry was acquired by the State of Virginia in 1950. 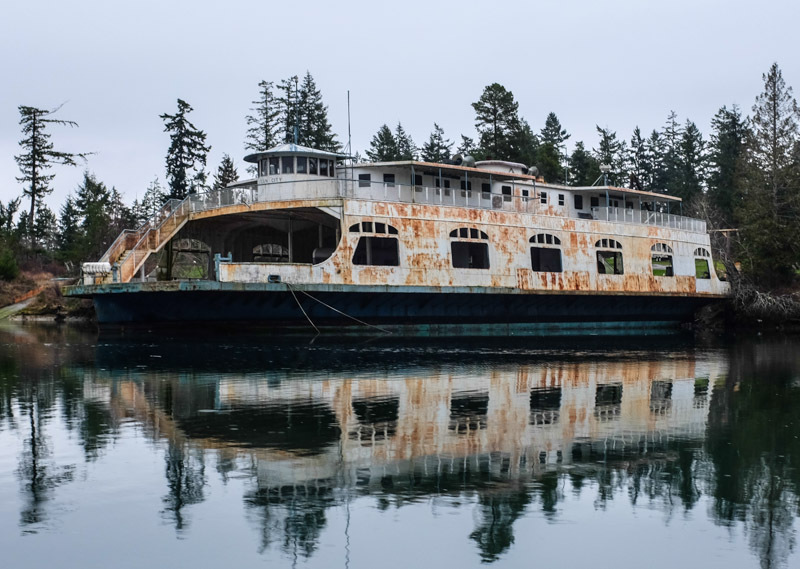 Captain Tom Palmer, a Pierce County Ferry captain, purchased the ferry in 1984, and hoped it would supplement his current 30-car ferry. From what I can gather, he and his brother brought Ocean City from the East Coast to Puget Sound via the Panama canal, a 7,000 mile, 54-day trip. Word has it the ferry service was taken over by Pierce County, and the Ocean City never got to help out. I grew up in Williamsburg, VA and made many a trip across the James River on the Ocean City. She came up the James to Surry from Norfolk, VA around 1957/58 when the Hampton Roads Bridge Tunnel opened and displaced the Ferry Service. I do not know when she first came to Hampton Roads, although there is a story of her being run all over Hampton Roads one night by a drunk captain and mate blowing the whistle and playing chicken with other vessels until she ran into dock in Newport News and got hung up in the pilings and was boarded by police who arrested the Captain and mate. She made trips between Hampton and Norfolk as well as Norfolk and Newport News. I believe that she was converted from steam to diesel around 1952. She had a 1600 horsepower Fairbanks-Morse engine in her and was very powerful. 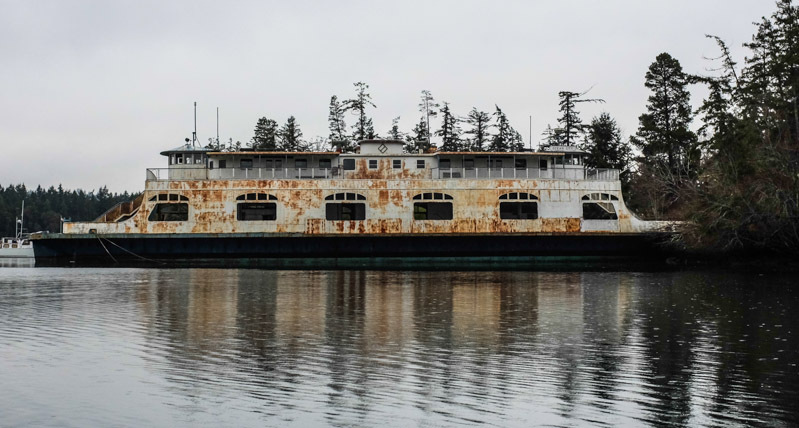 She was owned by the Virginia Department of Highways and she ran between Jamestown and Scotland Wharf in Surry County from 1957/58 until she was sold to the guys that took her around to Oro Bay in 1984/85. She could carry 48 cars. He had a contract to provide service to Anderson Island or was trying to secure one and had plans to repower her and provide service. I guess that didn't pan out. Sad to see her in the condition that she is currently in. I had seen the launch pictures of her and I believe that she had 3 sister ships that were identical. I think they all wound up in Hampton Roads. I think they were the Newport News, Elizabeth City, and the Warwick, but I may have that wrong. I also believe that they had converted them all to diesel and their superstructures had all been converted to the same basic look. This was before my time, so I will check on that and get back to ya. That 1980 photo is the Ocean City in the dock @ Scotland Wharf, Surry, VA. 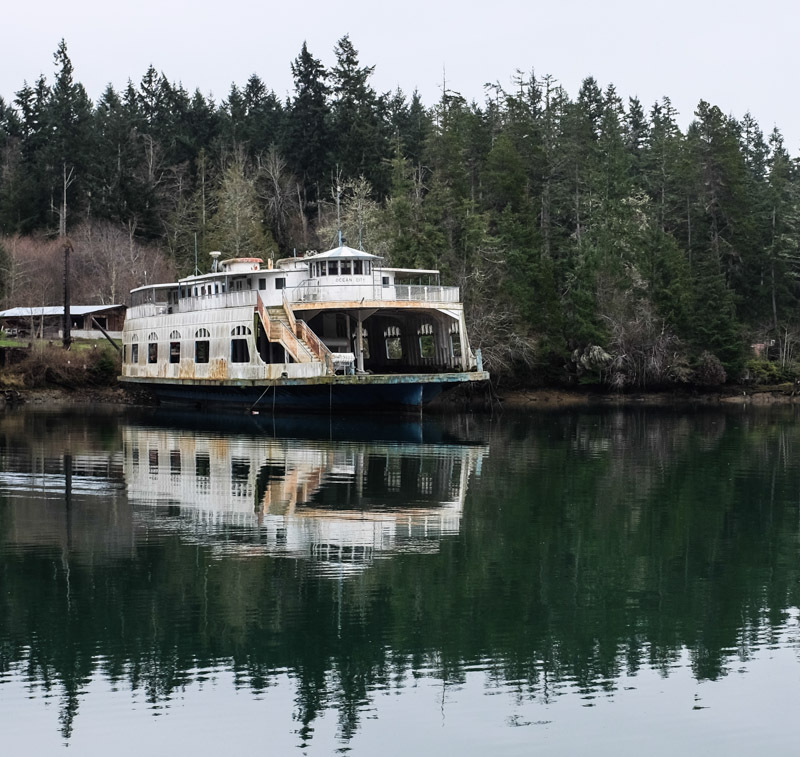 The backup idea was to convert the ferry into an excursion boat specializing as a kind of floating campground for RVers while touring the Puget Sound. There's an old silver trailer sitting there today, waiting. Awwwwww. Not gonna happen, but it was a cool idea, huh?